TOUR GUIDE RESPONSE: Hi the guy is Vusi. Thanks a million. An excellent tour by a local with local knowledge. A visit to the township should be compulsory for every tourist (we met locals on the tour too). Going into Orlando was moving and heart breaking. Well worth the price, if a little expensive for SA. Nathan was great, very friendly, the tour was fun, , informative, insightful and on time. I strongly recommend him and will definitely go on this tour again. Nathan was an excellent guide. During my one day private tour, I got to really understand the history of Johannesburg and had time to linger in places of interest. Nathan's knowledge of the events, people and the area of Soweto gave me a local's perspective that you don't get when simply visiting a place and reading plaques. He answered my questions and was able to tie in the past with the present. I recommend Nathan was a tour for anyone who wants a truly customized experience. Nathan is a great guide! We had a very interesting and instructive day with him. It will surely be one of the best memories of our trip to SA! We recommend him! TOUR GUIDE RESPONSE: You are welcome, was very happy to host you. It was such a great tour we had with Nathan. We learned so many things from him about the history of Johannesburg and of Soweto. It is such a pity we could not stay more than 2 hours. There were so many things to see. From the picking time to the end, everything went so well. Thank you Nathan for the tour. We hope we could do another tour next time we come in Joburg! We very much enjoyed our day with Nathan. He is a knowledgeable and pleasant tour guide. We thought visiting the Apartheid Museum and Soweto would be interesting (it was) but might be depressing (it wasn't). Nathan made it inspiring by giving us rich insights into the complexity of Soweto. He also showed us that Soweto is a huge area that is socioeconomically diverse and alive with commerce and social activity. Thank you, Nathan, for being such a gracious and informative host! Nathan is a great guide: knowledgeable and a good communicator. On this trip, my friend's flight was a day late requiring some adjustments in the schedule which Nathan was able to make and still give a great tour of Soweto. This is the second tour I have booked with him, and I would book another. I highly recommend him. Nathan was a great guide, very passionate and knowledgeable and willing to answer our questions about the political and social development of South Africa. Introduced us to Vusi who took us into the Shanty Town for a short thought provoking tour. Our only suggestion...a sign with name of client for airport pickups would have made contact much easier. Nathan took us to all the main attractions, The Apartheid Museum, Nelson Mandela's House, Soweto, to name a few. Nathan was on time, knowledgeable, courteous and a safe driver. We even had a tasty lunch with him. We would definitely recommend Nathan for a day well spent touring Johannesburg! Our guide Nathan was punctual , friendly , extremely knowledgeable and articulate. He went out of his way for our group of 4 in many ways. Lunch at Nandos at the mall in Soweto was fabulous. I highly tecommmed this tour with no reservation. Nathan is a very knowledgeable tour guide. He picked us up from the airport and took us to do a tour of Soweto. The highlight of the tour was seeing the slums in Soweto. Also, all four of us are vegetarians - Nathan arranged lunch for us that was very good. Knowledgeable. Good command of the English language. It was very hot and the air conditioning in his car basically was non functional making it very uncomfortable. His car was too small for a party of three. Two is the maximum for comfort. One in the front and one in the back. Wonderful tour! I was impressed with the flexibility of these tours, and how a tour can be tailored to fit your needs. Highly recommend! TOUR GUIDE RESPONSE: Thank you Flo and bless you. Very impressed by Nathan's knowledge of history of his country. He gave a very thorough tour of Jo'burg, Soweto, and everywhere inbetween. I highly recommend this tour. Put on your walking shoes, and be ready to trek through the big city! All of the tours Nathan guides are well worth the investment. TOUR GUIDE RESPONSE: You are welcome and thank a lot. Nathan is good company and quite knowledgeable about Apartheid He was flexible to set up a tour with me on short notice when I realized I was stuck in the airport all day. The most moving part of the day was visiting the Hector Peterson Memorial. TOUR GUIDE RESPONSE: Thank you Sandy considering that this was a last minute booking. I am glad I was able to organise this tour for you at a very last moment. It was quite challenging. Wishing you all the best. TOUR GUIDE RESPONSE: You are welcome and thank a lot. It was a pleasure to host you. Nathan was timely, accommodating, knowledgeable, and very kind. He tells the stories of the various townships south of Johannesburg with an understanding of the history and the effect on the lives of the people involved. He sees a future for himself and he has a positive attitude. Nathan showed us a wonderful day on our first day in Africa. Thank you, Nathan. Nathan is an excellent guide who knows very much of his town and he tells about it in a very personal way. We have seen the many aspects of the townships of Johannesburg in Soweto. He took us to the apartheid museum, very impressive and later to Mandela house. The trip into the township with a local man I will never forget. Nathan gaves us an unforgettable day. Highly recommended. TOUR GUIDE RESPONSE: Hi Henk You are welcome and thank a million. Nathan was very friendly and informative--great tour! It's amazing how much he knows about the city. I would have liked a little more context on what was coming next (I forgot the details from the web description), but it was also fun to be surprised! We had a great day with Nathan. He was extremely knowledgable and has an amazing memory for facts! We had some really interesting conversations. We LOVED the Apartheid museum, Mandela's house and the Hector Pieterson memorial was so moving for both me and my 13 year old son. He related to both of us so well and we learned so much. Thank you Nathan! We booked a full-day Soweto tour with Nathan. He is knowledgeable, professional and native from Soweto. The visit of the Apartheid Museum, Nelson Mandela house and wider Soweto provided us with a good historical background and every day challenges people face today. The visit to the poorest parts of Soweto need a properer warning for over sensitive people due to the harsh reality for these people. But overall we were very happy with the day we spent with him and recommend him. Excellent and knowledgeable guide. Highly recommend Nathan! I had a great tour with Nathan. The first stop was the Apartheid Museum. Then to Soweto to see the different areas there. This included a stop at the Nelson Mandela Museum and lunch. There is also a stop at one of the shantytowns in the area. I appreciated the opportunity to see this area, and not just the tourist areas. Great guide. He took us to regular tourist attractions as well as off the beaten track. Nathan was very personable, very knowledgeable, and has a great sense of humor. He was also very flexible in picking us up at the airport and then dropping us off at our hotel after the tour. He adapted the tour to the time that we had and maximized daylight hours. I would highly recommend him! Nathan was an excellent, attentive, knowledgeable guide. He went the extra mile, spent extra time and provided great insights. Fantastic tour with Nathan, his knowledge of Soweto and Johannesburg is excellent. He was also able to accomodate my tour at late notice and adjusted the schedule for a later arrival. The tour with Nathan was one of the highlights of our trip to South Africa. Nathan took care of all the details and he tailored the tour to our interests and our schedule. He has impressive knowledge of Soweto and his tour provided a full experience of the many facets of Soweto. Well done Nathan and Tours by Locals! I was very impressed with how knowledgeable and intelligent Nathan was. I learned so much from this tour, it was very eye opening. I highly recommend Nathan as a guide! Our tour is something we will never forget and touched our hearts. TOUR GUIDE RESPONSE: I am delighted my tour had an impact on you. We had a great introduction to the many, varied areas of Soweto, from the upper class areas to the meagre shacks and huts. We experienced the history of the area first hand. The only negative was that this tour, as opposed to all other Tours by Locals that we took, was not fully paid for in advance. This surprised us because we had not read all the details. Fortunately, we had enough cash on hand, but we could have stopped at a bank anytime on the tour. This was a great introduction to Soweto and its most recent history. Nathan is a great guide and we not only found it educational but we enjoyed Nathan's company! Highly recommended! Nathan was a very informed, interesting and engaged guide. We thoroughly enjoyed our tour and can't recommend this highly enough. If it was possible to give the guide 10 out of 5, we would. Thank you Nathan. TOUR GUIDE RESPONSE: Thanks a lot Angela and bless you. Nathan did a wonderful job sharing his knowledge of Soweto! It was very eye opening to see all the different elements of the township. The tour included a great lunch too! Well worth the money! TOUR GUIDE RESPONSE: Hi Carol, thanks for everything. I am glad to have hosted you. Many thanks to Nathan for opening our eyes to the history of Soweto and the reality of life there both past and present. What a revelation this tour was...We have a much greater appreciation of this place after this tour. The story of Soweto was shown to us by someone who knows it. Nathan delivered! Nathan is experienced, well spoken, thoughtful and objective. The tour was customized to our schedule and he was very accommodating. He is a guide you can trust. Nathan gave us a very good look at behind the scenes Soweto and the history of the sites he took us to. He was very obliging and a good driver, we all enjoyed our time with him. Traveled alone and booked the half day Soweto tour. So Nathan could take all his time for me, I learned and saw so much, never expected that. Had some expectations what I would see but Nathan showed me more. Parts of the tour will be a once-in-a-lifetime experience, as I even had the opportunity to talk to other locals and to get the deepest possible view in the life of the people of Soweto. I left Soweto both, positively surprised as well as shocked and sad! I can only recommend this tour! Thanks Nathan! Nathan is outstanding. We are accustomed to 5 star services- not disappointed. He not only provides an extensive tour but also engages other people with a deep history and cultural understanding. Book him! I was so glad I chose Nathan for my tour. He was interesting and informative. I had a really unforgettable great day. TOUR GUIDE RESPONSE: Hi Roseline, you are welcome. Nathan was an inspirational guide. We learnt so much about the history and life of Soweto. This was a real insight tour. Not a touristy tour. Would highly recommend to all visitors to Johannesburg - we were only sorry we could only the half day tour. Nathan is extremely knowledgeable about Soweto, his home. We were worried that taking a tour through Soweto would feel like a disrespectful cultural safari, but that was not our experience. I would wholeheartedly recommend Nathan and his services- a great guy! TOUR GUIDE RESPONSE: Hi Christina, thank for your experiences. Nathan was very friendly, charismatic and had many interesting stories to share. The planned agenda is quite good and the locations given an extra dynamic thanks to Nathan's enthusiasm. TOUR GUIDE RESPONSE: Hi Rania, the 3usd was not a payment for the guide in shanty town but a gratitude per se. I actually paid him much more than that. The 30 minutes allocated was standard and in doing so we had to balance your adventure and intetest in an underpriviledged area and at the same time avoid being seen as a disrespectful cultural safari. And what was of utmost importance was your safety.We could not expose you to unsuitable elements no matter how comfortable you felt in that area.Your safety was a priority. TOUR GUIDE RESPONSE: Hi Nur, thanks for your comments. Johannesburg is a very old city with old infrastructure. And it is recent that they began upgrading and modernising the infrastructure. As you have also witnessed how really bad traffic is. One may a road this week only to find next week closed because of upgrades. So most of times factors such as weather and traffic will have an impact. Otherwise once more my apologies for being a little late. We had a great tour of many informative and eyeopening sites. 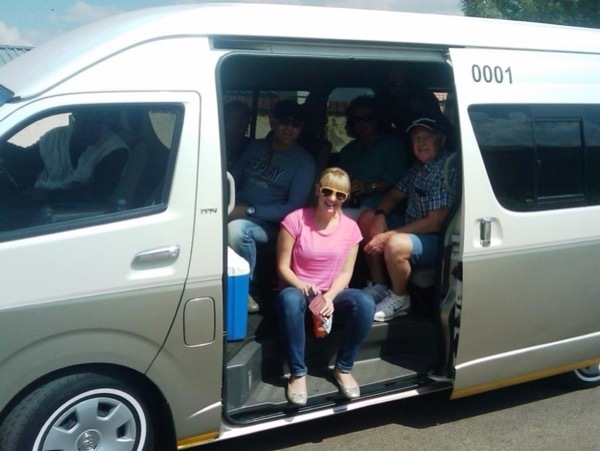 A tour that exceeded our expectations and that we highly recommend to all visitors to Johannesburg. Nathan showed us the extreme sides of Soweto from the high rent district to the poorest district and what lies in between. We were well taken care of and felt safe as well as comfortable at all times. TOUR GUIDE RESPONSE: Hi Anders, it was such a pleasure to host you. Excellent all day personal tour of Soweto. Highlights were the 2 hours spent at the Apartheid museum which gives a superb overview of recent African history and also the chance to meet with a community worker who gave an enthusiastic and optimistic account of his work in the poorer areas of Soweto and the challenges that the community there face. A walk through these streets was worth more than a thousand words. TOUR GUIDE RESPONSE: Hi Brendan, I am glad that you had an interesting time in Soweto. TOUR GUIDE RESPONSE: Hi Roger, thanks a million. We just took a tour with Nathan and he was terrific. We saw and learned more than we possibly could have imagined in the short time we had between flights into and out of Johannesburg. I give him my highest recommendation and 5 out of 5 stars. TOUR GUIDE RESPONSE: Hi Eric It was such a pleasure to host you. Bless you. I had an excellent day with Nathan in Soweto. He is very knowledgeable about Soweto, has a very relaxed style, and is pleasant company. I was glad I choose for Tours by Locals and not for a bus tour. TOUR GUIDE RESPONSE: You are most welcome. Thanks for a fantastic day with your presence. Thank you Nathan for a very friendly, warm and informative tour of your township Soweto. You have opened our eyes and encouraged us to see into your town and your culture, sharing with pride the improvements and growth of your SOuthWEstTOwnships. TOUR GUIDE RESPONSE: Hi Gene I am glad that you had a lovely time. Bless you. Amazing! Nathan takes the time to explain the context and history of the area, how that leads to the current situation. And he's sensitive to how comfortable his guests are with the content of this intense and "heavy" tour. We had an incredible time and Nathan was great. I'd highly recommend. TOUR GUIDE RESPONSE: Thank you so much for your presence. He knew what he was talking about. Very interesting conversation on the area and country. Careful driver. TOUR GUIDE RESPONSE: You are welcone. Nathan was Wonderful! The clients were very pleased. TOUR GUIDE RESPONSE: You are welcome. Thanks a lot. I was to do this trip alone and was quite anxious at spending the whole day in the company of someone I did not know, but I should not have been concerned, as I had a relaxed and memorable day, which was all thanks to Nathan's wonderful ability to put you at your ease. I would recommend anyone to go on this trip with Nathan as it made my trip to Joannesburg. TOUR GUIDE RESPONSE: Hi Andrea, you are wekcome. Nathan is friendly and looked after us well. He had a colleague to drive the car for him. We had a tailor-made tour which included the fairly new Liliesleaf Farm Museum (highly recommended) and the view of Jo'burg from the top of the Carlton Tower as well as visiting Soweto. It is true to say that Nathan's strength is Soweto and I would recommend him on that basis. TOUR GUIDE RESPONSE: Thanks Tony. A very informative tour of Soweto. Nathan the guide was very friendly and happy to answer any of my questions. The driver Teboho was great too. I learnt a lot about the history of apartheid and the struggle against it. It was a real surprise to me when I realised that Soweto is pretty much a city itself! Well worth it. Very educative tour and Nathan and his driver were great guides! We really enjoyed their knowledge and good humor throughout the tour and were greatly impressed by Soweto and its culture. It was really interesting and we really appreciated the added value of a truly local guide. Nathan knows the right balance of providing you information and guidance and when to provide you the space to read and go through the museum. Thank you Nathan for a great day in Soweto! TOUR GUIDE RESPONSE: Hi Sandrine you are most welcome. Nathan was amazing. He was extremely perceptive in not only understanding what I wanted to do and creating a 100% personalized itinerary, but also in understanding my personality and presenting information at a manner and pace I was comfortable with. I could tell he had worked many more hours than just during the tour. He had spent the whole previous day preparing to make sure I had the best possible experience. By the end of the day I had a personal friend. TOUR GUIDE RESPONSE: You are welcome and wish you all the best. Nathan was knowledgeable and courteous. He drove safely and answered all our questions. A fantastic tour. TOUR GUIDE RESPONSE: Hi Cathy you are welcome. Hope you had a fantastic Safari. Nathan was a knowledgeable guide, and we visited a few places larger tours don't go. Since we were on a small tour (2 people) with someone who grew up in Soweto, we expected to get more personal insight and hear about his personal experiences in the area, but the presentation was fairly canned and predictable. TOUR GUIDE RESPONSE: Hi Susie,I welcome your comments on the tour as it helps me to improve. I usually appreciate to be engaged as well by clients and that is why I always ask them to feel free to ask me any question so that their experience becomes as interactive as possible. I will keep your comments in mind. Nathan was very knowledgable, well spoken, kind, and thoughtful. He was able to explain complicated subjects in a short period of time. He also gave me space to experience the apartheid museum when needed, but explained more detailed stories as well. I can't recommend him more. Hire Nathan! Nathan also rescheduled a personal appointment to take me during the limited time I had available. TOUR GUIDE RESPONSE: Hi Barbara and Whitney, I am glad that I was of great service to you. Thank you so much and God bless. Nathan was a great tour guide. Very knowledgeable and friendly. Support local tour guides and use his services if you need someone to tour you through Jo Burg. TOUR GUIDE RESPONSE: Hi thanks for your kind words, hope you are enjoying your safari. Nathan was extremely knowledgeable, friendly, and flexible in putting together a Soweto tour that was both experiential and education and fun. I'd use him again anytime I was looking for a genuine learning experience about both the past and present in Soweto. TOUR GUIDE RESPONSE: Thanks Tom much appreciated. I booked this tour for a 530 pm start, from the airport Intercontinental Hotel. We spent 90 minutes in a traffic jam getting to Soweto. I would have preferred advice that this might happen, and I would have picked a different start time or rescheduled. The tour itself was fine. TOUR GUIDE RESPONSE: Hi James thanks for your message. Yes the 5:30pm was a rush hour time but if you remember well the traffic was made worse by a horse and trail truck accident. And by when we reached and passed by the accident scene the traffic disappeared. No one was as sickened and frustrated as I was by the whole traffic ordeal. I apologise for the traffic and yet Am glad you enjoyed the Soweto tour. Initially contacted Nathan back in December and clarified what I was looking for in a tour. I had an over-night layover in Jo-burg and wanted to take advantage of it. Nathan's email replies were always prompt and courteous. On the day of the tour my flight was delayed but Nathan was patiently waiting for me at our designated meeting point when I arrived. Overall, Nathan was very professional and highly knowledgeable of Soweto/Jo-burg and all that it has to offer. Thanks again for everything Nathan! We took the Soweto Township Tour with Nathan and had a wonderful day! All stops within this tour are plenty of historical meaning, fun facts and great atmophere. We especially enjoyed the Chris Hani Hospital and the 360 view from the tower in the Credo Mutwa Cultutal Village. The tour unfolded very smoothly, Nathan did a great job and included the Orlando Towers following our request. Don't miss this tour if you have the chance! TOUR GUIDE RESPONSE: Hi Eran you will remember that I had exactly one hour to do the Pretoria tour given that you wanted to be back at the hotel by five oclock. I picked you up at twelve noon and we left for Apartheid museum just after twelve noon where you had to spent close to two hours there. We arrived just after three and showed you the historic and heritage places of importance including the University of South Africa, Afrikaner Monument, Paul Kruger house, Pretoria Square including statues and Palace of Justice. TOURSBYLOCALS RESPONSE: We are sorry and surprised to see this review as Nathan has all 5 star feedbacks. We must mention that 24s prior to the tour the traveler asked to switch guides so maybe there was not time for Nathan to customize the experience. TOUR GUIDE RESPONSE: Hi Carol, that is sweetest thing ever said to me. I am so glad you really enjoyed it. You are most welcome. TOUR GUIDE RESPONSE: Thanks Derrick, this was a record for me. Nathan gave a fine overview of Soweto and answered many questions for us. However, I was surprised that he did not accompany us inside the Apartheid Museum and the Hector Pieterson Museum to offer more explanation or answer our questions on the spot. Especially the Pieterson Museum because the film and displays offered no contextual explanations. I would rate the day as a 3.5. Well designed, passionately given. Thank you Nathan for an inspiring day. Nathan is such a genuine and knowledgeable tour guide. I HIGHLY recommend. He was able to answer every question I asked (and I asked a lot) and knows so much from his own personal experience. The tour will really blow your mind. He showed me things I was never expecting to see. He is also flexible to do what you are interested in and I will definitely use him again on my next trip and recommend him to friends. Nathan has given a breathtaking presentation of Johannesburg and Soweto, with a deep knowledge of all aspects of the South African history. I suggest to everyone who wants to really understand this beautiful country to meet Nathan. This is surely only my first tour of many other more. thank you, Nathan! Very thorough tour, guide knew everything and was very nice! Lovely! My parents and I thoroughly enjoyed our half day tour of Soweto. Nathan was very accommodating of our schedule and our requests as they developed over the course of the tour. A particular highlight was the sunset over Soweto from the Oppenheimer Tour, stunning view!! Nathan was very informative and thoughtful. Awesome experience. Thanks to Nathan for a great historical review! Nathan was knowledgeable, friendly and creative. We flew in late in the afternoon and only had one full evening in Johannesburg. He had to adapt his normal day tour because so many things were closed, but we really got an experience of Soweto that was life changing. Nathan answered all of our questions openly and honestly, from his own life experience. Highly recommend him if you are visition the area. Thanks Nathan for a wonderful evening in Soweto! Well planned and highly informative. We learned a tremendous amount about South African society and would highly reccomend this tour to anyone wanting to get an intelligent and informed understanding. Be prepared for a very full day! Nathan is a warm hearted and entertaining guide. Did the full day Soweto tour with Nathan, which was an extremely fascinating yet touching experience. Nathan knows and loves to present all the interesting spots of this famous township, where he grew up and lives. He picked me up, drove me around, was full of knowledge and compassion, encouraged me to walk around by myself, we had beer in a shebeen and dinner in an authentic restaurant - an unforgettable day in Soweto. Nathan is highly recommended! Nathan was a very friendly and informative guide! I took the one day tour of Soweto given by Nathan. In addition to visiting Soweto (including Nelson Mandela's house) we also visited the Apartheid Museum. Nathan was very accommodating and also took me to the Johannesburg Art Gallery upon my request. Nathan is very knowledgeable and passionate about Soweto.